Why did you set up The Hair Station? There are lots of hair extensions out there but just a few of them are designed to enhance the overall looks of their wearers. It is not just about selling hair but the drive behind this business idea is making our customers look and feel good about their hair. The Hair Station is a female-oriented lifestyle brand, a part of the business line called Anirah. 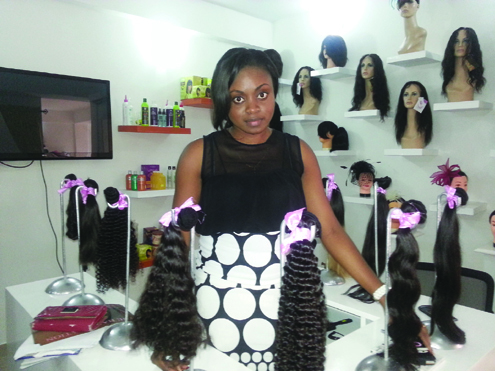 It provides four-key hair services: hair extensions, haircare products, hair styling services and hair accessories. Our products are branded and sourced from different parts of the world. Many ladies spend a lot of money to get hair extensions without getting the desired looks. The objective is to provide hairs that can withstand rain and the harsh conditions of our weather. Were you trained for this? Basically, I have interest in anything that has to do with hair care. I am passionate about hair. I have been exposed to haircare for a very long time because I am always attracted to good hair. I always want to know how it feels and how I can make it look better. It all started from wanting to know more about hair, learning how to fix and dye hair to finding way to maintain healthy and beauty hairdos. This passion drove me to set up the outlet. I want people to know that there is more to hair fashion than selling and fixing hair. I have worked with different hair extensions and weaves to know that hair can make or mar a woman’s look. What is your opinion about synthetic and human hair extensions and wigs? Can you give us quick tips on the treatment of human hair and weaves? Your wig is like your natural hair,you must take care of it. Women need to know that just the way they take care of their natural hair is the same treatment their weaves require. If you take off your weave on, you don’t just drop it somewhere until you need to re-fix it. No, the weaves need to be treated, conditioned and roll if necessary. To revitalise your weaves, it is not advisable to re-use them without washing. This is because weaves attract lots of dirt including the oil from the scalp.It is important for women to always wash, condition and roll their used weaves before re-fixing it. They must brush from the tip to the root of the hair to ensure the hair strands are not tangled. They should not use hair serum everyday, as constant usage could damage the weaves. It is advisable to use it once in three days. Deep conditioning of your hair before attaching a weave is important. You should always keep in mind that your natural hair will be kept for four to eight weeks without combing or brushing, so to minimise hair breakage after removing the extension you need to deep condition your natural hair. Let your hair rest for at least two weeks before attaching the next weave and use a deep conditioner to repair your hair as much as possible.